Link Ford Lincoln & RV in Rice Lake is always looking for the right people to add to our outstanding team! Is a career in the auto industry is something that you've been thinking about? 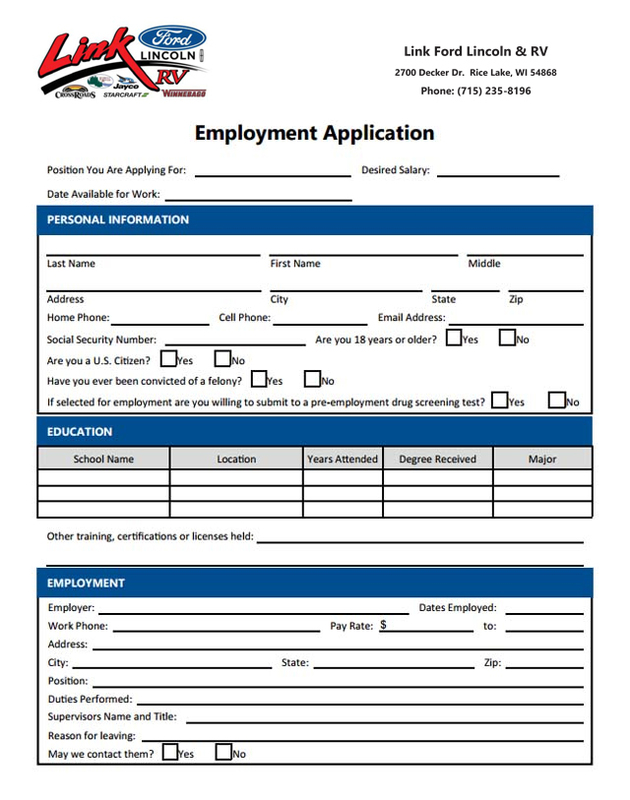 If you are honest, hard working, professional and excited to work at the premier Ford Motor Company franchise in northwestern Wisconsin, we'd love to have you download or fill out an employment application online today! Link Ford is looking for Service Techs of all Levels. Even if you don't have a Ford Tech Certification, we still want you and will work with you to achieve Ford Certification. Automotive Technicians are one of the most important part of an automotive dealership, and we realize this and recognize this. Salary based on experience. Call Sean Mykkanen at 715-234-8196 for details. Apply online or in person at Link Ford Rice Lake. Come work for a winning company with plenty of work to keep you busy. We are invested in YOU! See you soon!